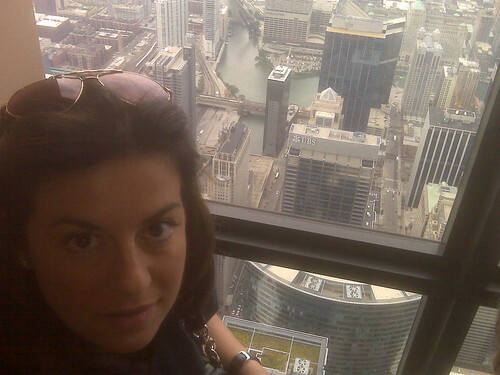 Sunday Morning Soliloquy - Musings of an Urbanite: The Willis Tower Skydeck - THE LEDGE! 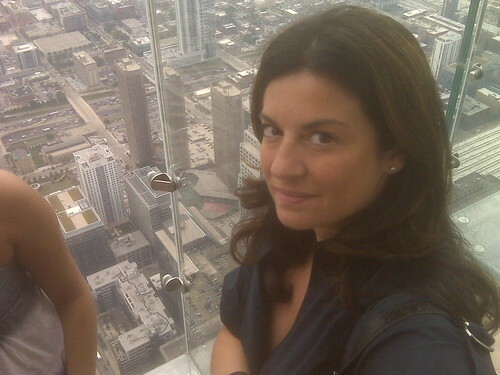 The Willis Tower Skydeck - THE LEDGE! Today, I had to be at The Willis Tower at 3:00 p.m., when I finished with my meeting, I decided it was too late to go home and continue working. 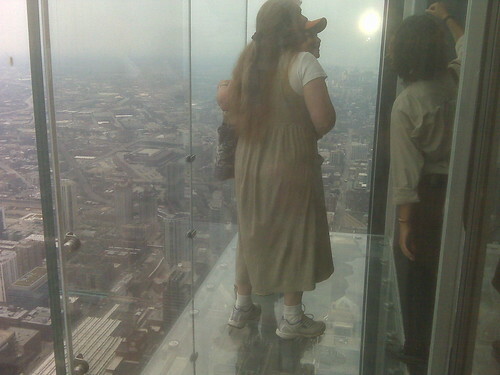 I thought it would be a fun idea to take a trip up to the Skydeck of Willis Tower (formerly Sears Tower) and walk out onto that much talked about LEDGE. If you're still unfamiliar with "The Ledge" - it is on the 103rd floor, or 1353 feet in the air, and it is a glass box that extends 4 feet OUT of the building. You feel as though you are suspended in mid air! When I arrived, the line to the entrance was excruciatingly long. The crowd can be likened to the group of tourists who choose to take part in the Freemont Street experience in downtown Las Vegas. The elevator ride is impressive, only 60 seconds to climb 103 stories, pretty cool. The film everyone was required to watch gives one a perspective on the history of the building, formerly known as Sears Tower, as well as a brief history of Chicago architecture. The film left me beaming with civic pride. However, the wait time to get upstairs....TOTALLY KILLED ME! I walked in the door at 3:30 P.M. and did not find myself outside again until 5:00 P.M. I strongly suggest paying the extra $15 for the "fast pass" if you can afford it. The fast pass will help you avoid the line to get upstairs and you will bypass the movie. If you do not purchase the "fast pass", go to the Skydeck website and purchase your tickets online beforehand. Purchasing your tickets online will save you about a half an hour. 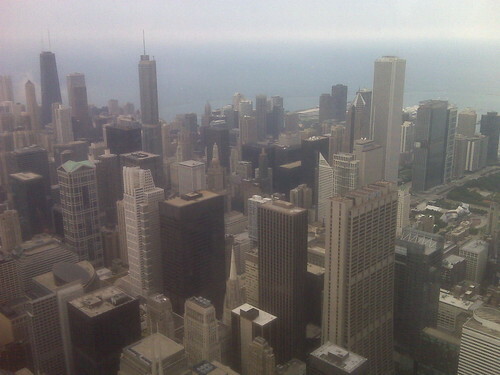 When I first arrived upstairs on the Skydeck, I walked around and snapped some photos with my Blackberry camera. I had not planned on visiting the Skydeck so I didn't bring my actual camera. (I USUALLY carry my digital camera in my purse, unfortunately, not today). My goal was to head STRAIGHT to The Ledge so I could stand out there and face my fear of heights! I walked all the way around the Skydeck until I finally arrived at The LEDGE. I waited in line to get out there for about five minutes. When I first stepped out onto The Ledge, I felt as though I was going to throw up. I quickly stepped off the ledge and let others get out there. Finally, I gathered the courage to DO IT and took another step out onto The Ledge. The funny part was, I found myself grasping tightly onto the wall, as if that would help me should The Ledge break free and fall to earth. 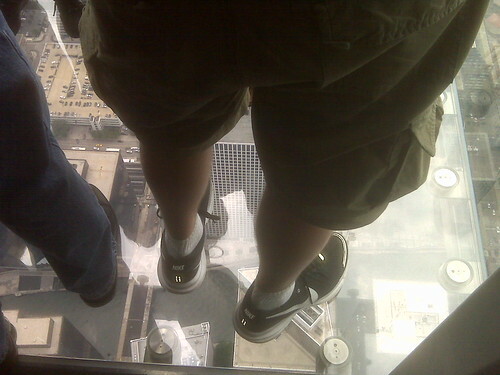 I never could make it all the way out the four feet to the glass wall, it was far too scary for me. MY FEET IN MID AIR! THAT LOOK ON MY FACE...ITS FEAR! I took this last photo while I as standing on my ledge. There are three or four ledges total. Each ledge can see the one next to it. From here you get a good view of this scary experience.